Some of the Economists I follow on Twitter pointed me towards this article. Journal of Economic Perspectives. 26 (3). Summer 2012: 49–68. Lane analyses the causes of the European sovereign debt crisis. I think he shows that except in the case of Greece, and perhaps Italy, the crisis did not begin in the public sector. As for the UK, the problem began in the private sector. Government borrowing did not start in earnest until the 2007 credit crunch. 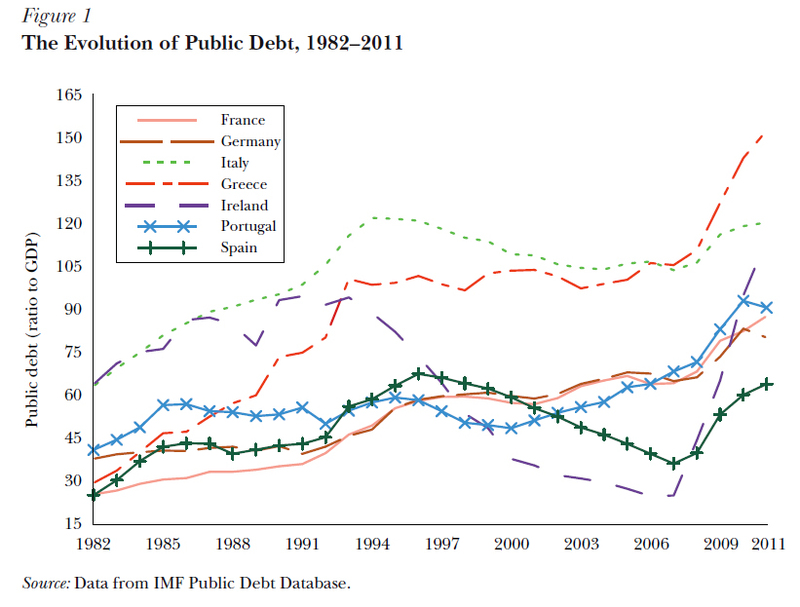 The exceptions are Italy and Greece which were already approaching debts of +90% of GDP by the end of the 1980s. 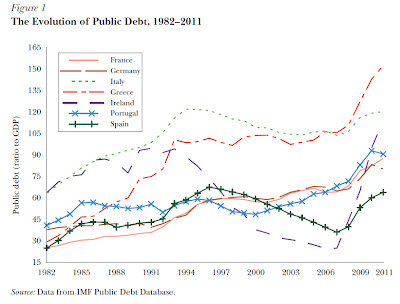 Indeed Ireland's and Spain's government debt were the lowest of the countries in the study and trending downwards. 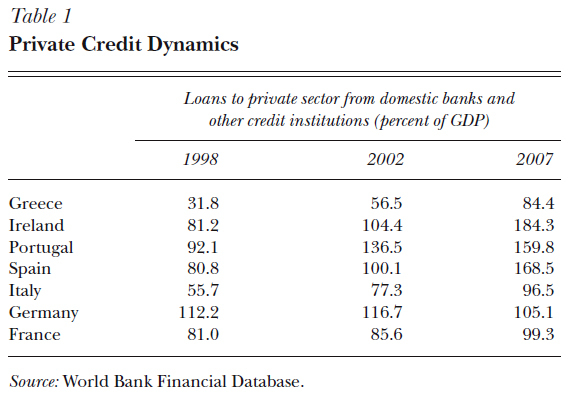 As Lane says Ireland and Spain were not net borrowers from 2003 to 2007. 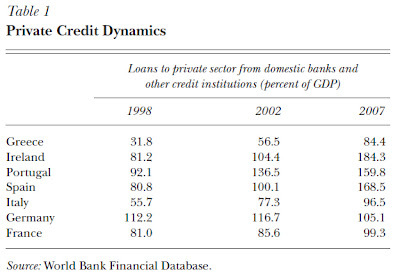 At the same time private credit was rising exponentially partly because when they joined the Euro banks in these countries could suddenly source loans in Euros from outside their national borders. of current account deficits and credit booms is still lacking." "Rather, households were the primary borrowers in Ireland and corporations in Spain, with the property boom fueling debt accumulation in both countries." If I understand Steve Keen's arguments about this then the effect was precisely the opposite, i.e. debt fuelled a property boom, not the other way around. Debt did not simply accumulate which makes it sound passive, but the banks were actively creating debt and pursuing customers to become debtors and go deeper into debt. Especially in the USA mortgage brokers were disconnected from the consequences of bad loans - hence the sub-prime mortgage market was centred in the USA. Vast numbers of loans were issued which could not realistically be paid back in a boom, let alone a slump. During this period rating agencies, paid by financial institutions, were giving junk derivatives AAA gilt ratings so that pension funds could 'invest' in them. Goldman Sachs in particular used the AAA rating to continue selling what they knew to be a junk product as gilt, and to take advantage of low insurance rates to create hedges on loans they knew would default. The effects of this were felt worldwide. Especially when the market collapsed. Lane points to a failure of fiscal policy in the period 2003-2007. But during this period, which Ben Bernanke dubbed the Great Moderation, economists who were, and remain, blind to the problems of private debt, convinced themselves and western governments that growth would continue for ever. They were saying so right up to the eve of the credit crunch. The failure of governments during this period was not fiscal but regulatory. During this period an increasing number of economists began to warn about the growing private debt, but were ignored by deluded governments. Ultimate Lane blames the crisis on the design of the Euro beginning in 1999, though I'm not convinced this is the answer because we see the same kind of crisis in the UK, and the USA. I'm more inclined, following Steve Keen and Ann Pettifor, to see private debt as the central problem. Certainly the Euro design has hampered all efforts to deal with the crisis, but then none of these countries has even acknowledge that they have a private debt problem caused by deregulation of finance. And as such the regulatory environment remains unchanged, and banks are still pumping money into casino investments rather than the real economy. Until banks and other financial institutions are properly regulated and policed there is little hope of recovery, and every danger of it happening all over again. Indeed those foresighted economists who predicted the crisis on the basis of private debt problems have predicted a further major credit crunch in the near future. In the short term some kind of debt relief program--Keen's modern debt jubilee--will help to kick start growth, but ultimately the finance industry must be properly regulated. I think those of us not bound by the formalistic conventions of academic publishing can be far more boldly pessimistic. There is every likelihood of another global credit crunch. The Euro cannot stand as it is because it's foundations are insubstantial, the mechanisms they have to deal with the problem won't work, and they have yet to acknowledge the underlying problems regarding financial institutions and endogenous money creation. One or more countries--certainly Greece, but probably Italy, Ireland and Spain--will be forced out of the Euro. Finland may go as well. What's left of the Eurozone will, like the UK and the USA, remain stagnant for a decade or more, like Japan in the 1990s. The BBC provided some very good background info-graphics to the Eurozone crisis earlier in the year. If it's all too miserable then John Finnemore explains it in a humorous way here.